The stated aim of the, then Great, Repeal Bill was to provide clarity and certainty for citizens and businesses, and to ensure a functioning statute book on exit from the EU. The key statement of principle in the White Paper was as follows: ‘In order to achieve a stable and smooth transition, the Government’s overall approach is to convert the body of existing EU law into domestic law, after which Parliament (and, where appropriate, the devolved legislatures) will be able to decide which elements of that law to keep, amend or repeal once we have left the EU. This ensures that, as a general rule, the same rules and laws will apply after we leave the EU as they did before’ (for analysis, see here). Yet this fair treatment does not extend to immigrants who the Coalition plan to subject to further unfair treatment at the hands of private landlords. The intention is to impose upon landlords a requirement to check the immigration status of tenants or face heavy fines. It is not clear which of the above reform goals this is designed to address: it seems to be a general measure to disseminate throughout society a message of ‘crimmigration’ – the criminalization of immigration whereby those who cross borders are per se regarded as a security threat and subjected to constant policing and monitoring. Many have already questioned how this duty will work, given that there is no current register of the millions of private landlords in the country. Why should they make the effort to comply, even with the threat of fines? In order to make such sanctions effective they will have to be closely enforced; surely it will undermine the Conservative goal of reducing ‘red tape’ to introduce the necessary enforcement regime? Furthermore, given that discrimination on the grounds of nationality has been prohibited under EU law since 1957, can the government introduce a measure which explicitly targets non-nationals, including those arriving from the European Union? Stability, Coordination and Governance: Was a Treaty Such a Good Idea? In the margins of the European Council meeting on 2 March, the leaders of twenty five European states formally signed the Treaty on Stability, Coordination and Governance in the Economic and Monetary Union (the SCG Treaty aka ‘Fiscal Compact’ Treaty). When compared with the rancour of the December European Council summit which saw the UK Prime Minister block a direct revision to the EU treaties, for President Van Rompuy– celebrating his re-election as European Council President and appointment as the new Euro Summit President – the Spring European Council was conducted in a “team spirit”. More importantly, for Commission President Barroso, the treaty signalled the “irreversibility” of the Euro and underpinned its credibility. As with my earlier contribution on the European Stabilisation Mechanism (ESM) Treaty, I want to reflect on this turn to treaties as a response to the economic crisis. As is by now well known, the unwillingness of the UK government to negotiate a revision to the EU Treaties without obtaining certain ‘safeguards’ for its financial services sector prompted other EU states to turn to the vehicle of an international treaty to enshrine in law a ‘fiscal compact’ among participating states. In the end, the Czech Republic also decided that it would not participate, leaving it to the remaining 25 EU states to agree a treaty amongst themselves. There is much that has already been, and will be, written on the SCG Treaty. The issue of the very legality of the Treaty has itself been discussed with UK MP Bill Cash succeeding in obtaining an emergency parliamentary debate on the issue. For the moment, there are three main issues I want to illustrate. The first is the necessity of treaty reform. The second is the consequence of bypassing the mechanisms and processes for EU treaty reform. The third is the role played by domestic constitutional requirements. European institutions have reacted to the economic crisis by adopting a range of legal instruments intended to strengthen economic governance. With the adoption of the muscular ‘six pack’ of legislative measures, the talk in Brussels was of the return of the ‘Community Method’ as the Europeam Parliament – exercising its new powers of co-decision in the economic field – and the European Commission signalling their collective unwillingness to let ‘intergovernmentalism’ weaken the legislative bargain. Subsequently, however, the initiative shifted to the leaders of the Member States as talk began of the need for treaty reform. 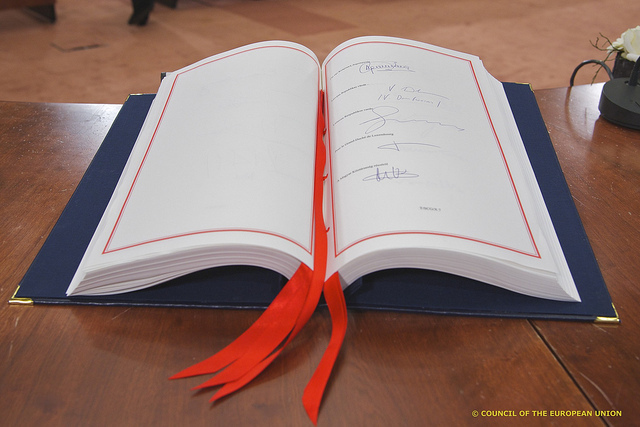 Barely two years on from the completion of the tortuous process leading to the entry into force of the Lisbon Treaty, and despite the prophecy of the UK Foreign Secretary in October 2011 that treaty change was ‘years away’, an informal meeting of the European Council on 30 January 2012 endorsed two new treaty texts to establish a permanent European Stabilisation Mechanism (ESM Treaty) and to enhance coordination, stability and governance in economic and monetary union (CSG Treaty aka ‘Fiscal Compact’ Treaty). My interest lies not in the content of these reforms but rather the processes associated with these initiatives. At its simplest, the argument is that the choice of legal instrument also entails choices as to the decision-making process to be used. Yet variations in process also entail variation in the mechanisms for democratic and constitutional approval: mechanisms which – like the UK’s recent European Union Act 2011 – have themselves evolved in response to past treaty revisions. In this way, the legal response to the economic crisis is a perfect illustration of the complex interweaving of EU and domestic public law. In this first of two contributions, the issues surrounding the adoption of the ESM Treaty are discussed. The CSG Treaty will be discussed in a subsequent piece. This post originally appeared on the UK Constitutional Law Group Blog and is re-posted here with thanks. 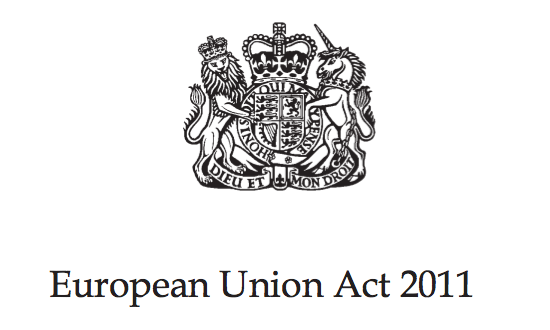 The European Union Act 2011 (EUA) is an unprecedented constitutional experiment. This post will outline the two main innovations of the Act: (1) the section 18 ‘sovereignty’ clause; and (2) the scheme of ‘referendum locks’ introduced in sections 2, 3 and 6. Three key questions raised by the EUA for UK constitutional lawyers will then be identified, and some tentative responses to these questions sketched. The post draws on an article written in collaboration with my colleague Michael Dougan, which is to be published in the February 2012 edition of the European Law Review.